The choice of sutured or stapled oesophageal anastomoses is dictated largely by personal preference. Such comparative studies as are available show no significant differences in the rates of anastomotic dehiscence1,2. Sutured anastomoses are marginally more time consuming to perform but are associated with a lower incidence of anastomotic stricture3, particularly when the smaller staple heads are used. 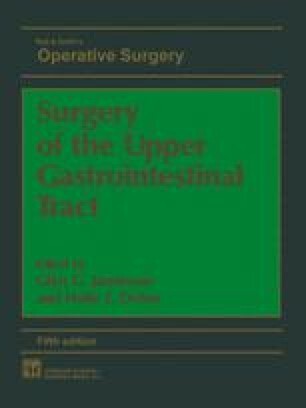 The author’s preference has been for hand-sutured anastomoses using the technique described, which has produced reliable results over almost two decades.